So I've been playing for some 20 years or so with varying levels of commitment in that time. In the first ten years performed with some bands as a firstly rhythm guitarist then onto also adding some soloing in. The town I live in is a live music 'desert' so kept playing by myself but really only to keep up some level of competency. Fast forward to 5 years ago and the marriage, house then kids projects started and I had more at home time to play, firstly updating my multi fx unit to a boss ME50, soon after purchasing a Boss looper RC-2. Started playing everyday again and noticed the old practice amp is not cutting the mustard with the drum/bass I was then adding with the looper. So back down to the shop and reasons that will become evident, chose a Marshall stack MGHDFX. considering I'm playing blues with a jazz coloring probably not the best choice BUT seemed to be the only unit capable of handling the drums/bass without distorting even at very low volumes. Fast forward another few years and the dream of performing again is still alive so had been trying to jam with ppl to form something....again the 'desert' is still hot and dry so that hasn't been going so well. Without the prbs that come along with rehearsing, difficult ppl or simply no ppl! So I've popped the busking cherry so to speak and looking at my gear once more, thankfully I had a loaner amp (peavey delta blues tube amp so also popping my tube amp cherry hahaha) as a stack isn't really a good option BUT the Peavey also suffers from the same distortion my old SS peavey amp did! I was told any amp with an open back would distort with drums even at low levels plugging the Marshall in immediately drums are tight and bass crisp no distortion even at HIGH volumes so perhaps the shop was right! So that was all typed using tapatalk, stoked that the forum has added this great work btw!!! That's such a great story. Way to go. I would have been shaking too, and I play out a lot. I've just never gone solo. You got cajones. Some of the solo guys I've seen over here use a small PA and modelers. 2 1x12 or 1x15 cabinets with horns on stands and an all in one PA head. You can probably score all that for what you can get out of the Delta. Don't sell it cheap. Those are worthy amphs. All you'd need is a 'character' pedal or your ME50 along with your looper and you should be good to go. Better fidelity. You could even go compact with the PA head and one cabinet, or better yet a keyboard amp. Those will handle the wide frequency range you need. Yeah, awesome story man. Nice Job. You make we want to use my Jackson for Blues and Motown! Very cool. I can't imagine what I'd play if I was by myself with an electric guitar and looper. I think it would be noodle city, which would get rotten tomatoes thrown at me. The fact that you made some decent coin while busking says a lot for you. Nice work! If anyone has any recommendations about amps/PA/modelers etc etc I'm all ears I have very little experience with the gear side of things even though I now own some pretty decent gear.....still learning so much about such a wide variety of all things musical! Hahahaha thnx mate...!! Although I was using my Yamaha SA2200 (not the Ibanez) for the busking gigs so these days my guitar is closely aligned to the music I now play....|The Ibanez was great for the music I used to play and even when the music changed I still found it a great sounding guitar, esp with the ME50 which isn't the best but good enough. The Yamaha now really sets it off, however I was and still am very nervous about using a $3000 guitar in public! Shhhhh better not tell anyone what it's worth! Very cool. I can't imagine what I'd play if I was by myself with an electric guitar and looper. I think it would be noodle city, which would get rotten tomatoes thrown at me. So.....again LOL is it important to have Fx loop on these PAs? They didn't have any of the Roland Street Cubes available, but said it would have same issues or popping noise emitted when kick drums are played. He demo'd a Roland Keyboard amph - KB2 however it also seemed to distort/pop with some drums not all but definately with some - it also requires power (no battery option). Roland Street cube and Peavey KB2 options where less than $500. After that, they have battery powered Roland BB something or rather, a full on battery powered PA but they believe I will have issues with drums.....and is more like $1000+. For now, I am street busking so some kind of battery power is preferable and easily opens up many more busking spots to me. My overall plan/hope is that one of the local pubs/clubs will see me playing and with any luck someone will ask me to play sunday arvo's in their pub, I say sunday arvo's cause my music is chilled out sunday cafe type music. . . . . so in future I MAY need something more along the lines of the full on portable PA system. . . . still size matters so am still left wondering, going to the shop probably raised more questions than it did solve any! Crate makes the Taxi which is battery powered. FusedGrooves, cool stuff, that you've found this can be a fun and profitable outlet for you. I'm surprised you're having so much trouble with drum popping and can only guess you're running something pretty sophisticated or powerful. I use 2 different acoustic amphs, each with 2 channels, one with a 1/4" AND XLR for a variety of input options. I'll then find a drum track on my Boss RC2 looper, lay down a bass track, then an acoustic guitar progression, or electric rhythm progression. Then I usually plug my electric into an electric guitar amph and practice lead work. I have run the electric through a multi effects pedal and through the same acoustic amp, and it sounds pretty good. Occasionally, I'll get pretty loud and turn the acoustic amph with drums and all up. Popping has never been a problem. Now, it's not the greatest sound quality as far a drums go, that's for sure. The acoustic amphs are a Marshall AS50D and the Fender Acoustisonic 30. The Marshall has an effects loop, and takes pedals pretty well. No battery options however. I use them both at open mics often, run vocals as well as acoustic guitars through them, and they are plenty loud. HTH. I wouldn't take the sales persons word for too much (cynicism showing) bring your rig and try gear out. Good luck. cojones of steel !!! Congrats ! Ok so the GAS has settled down a little bit, in wanting to make the right choice I've held off this long already whats a few more weeks. I can still loan the Delta blues for now so will continue using it to earn a few extra bucks to help pay for the gas. Right now, I think I've settled on the Roland BA-330. It's powered. BIG plus. Speaking with Roland direct they see no issues with clipping and or popping/distortion with ANY signal I send it's way.....not what the shop said so I tihnk he was triyng to talk me into the Peavey KB-2 KB amp which was terrible but the only option that was quick easy to check out at the time. Roland also sent me a diagram on how to hook it all up - they advise there is no need for a Fx loop but still unsure about this. They recommendation was to plug guitar into Tuner > ME50 > RC50 and then to PA. This goes against everything I thought was right in that you amplify your signal first, then add Fx etc. So being that these are fairly specific questions, using gear that is not entirely common, this weekend I will take my rig in and test it with known options. The BA-330 seems it will fill my needs now perhaps overkill a little (as was my RC50 when I first got it, now I can't use an RC2 cause it lacks features of the 50 but I digress), but if I happen to get other gigs as a result then this will also suit future needs should they arise and that was the *hope* plan anyhow..... It's a bit more $ than I wanted to spend, but that's ALWAYS the way with gear if you get decent stuff to begin with. Thanks to all for the many tips/suggestions....I will write a review once I've decided and bought in case anyone has similar questions. Depending on where you live that can be taken a couple of different ways. The Roland guys told you just how I would have suggested to hook it up too. Don't forget to try it all out before the next gig to make sure it works out okay. 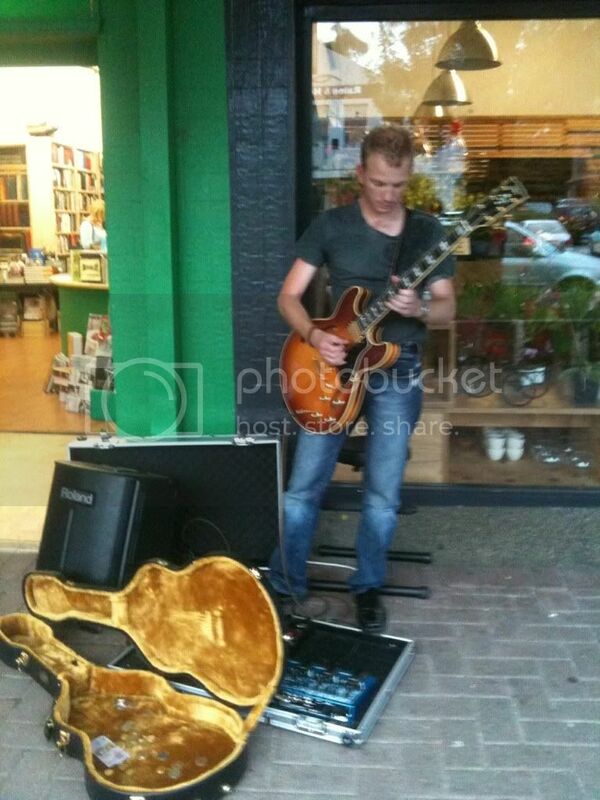 Did some more busking on Friday night, it went so well and I had such a good time I had to go back on the Sunday too! At some point (like when I win the lotto) I would consider seperate guitar amp to send the signal through the PA but that's more gear than what I'd like to use busking, more $$ than I have to spend at the moment too! To be truely battery powered I need to work out a solution to run the ME50 + RC50 which is proving quite expensive! I'm glad to hear that is turning out to be a consistently pleasant experience for you. Get someone to take some pictures of you next time so that we can tell that you aren't just some teenage kid pulling our leg on the internets. Would a teenager take the time to write such an involved OP? Would a teenager use my extremely eloquent (LOL) written skills? Sorry about the phone and photobucket problems, but it was all worth it. That picture says so much. It's the real deal man. You be doin' it. So cool of you to share this. Maybe it will inspire someone else (with a more reliable phone ) to do the same. Keep it up street slinger. 'Street Slinger'...... that's a pretty cool forum name! You could also check into the Tech 21 character series pedals. They sound like amps and are very portable.